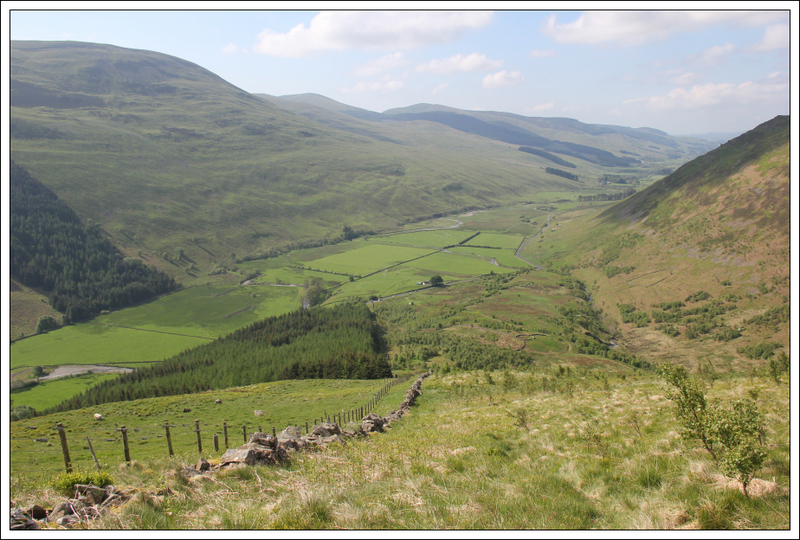 My original plan for today was to ascend Carrifran Gans from Carrifran (up and back) and then drive to Ericstane to ascend Whitehope Heights (up and back). 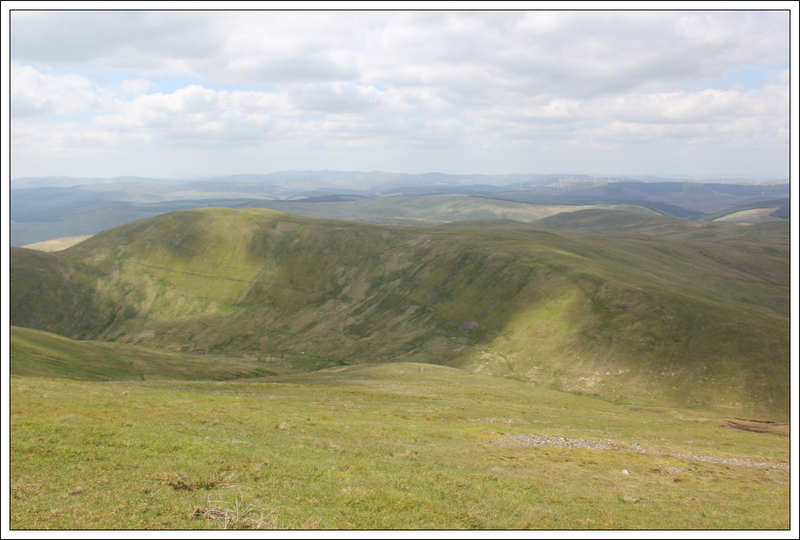 However on studying the map I noticed that I could potentially ascend Carrifran Gans and Whitehope Heights in a traverse that would also take in White Coomb and Hart Fell via the interestingly-named Rotten Bottom. 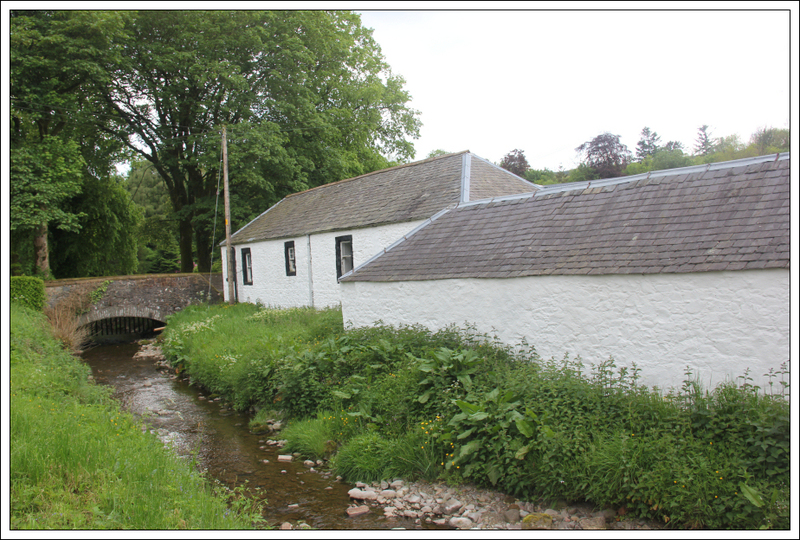 I therefore decided to drive to Ericstane (leaving the car parked there) and arrange for a taxi to pick me up from Ericstane and take me to Carrifran. This would allow me to undertake the traverse with my car conveniently located at the end of the walk. 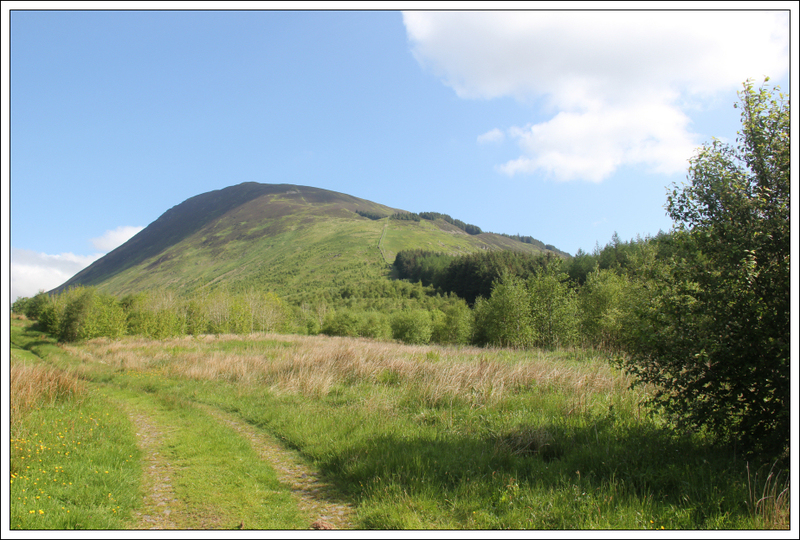 After getting dropped off at Carrifran, I followed a good track for several hundred metres before taking to the hillside. 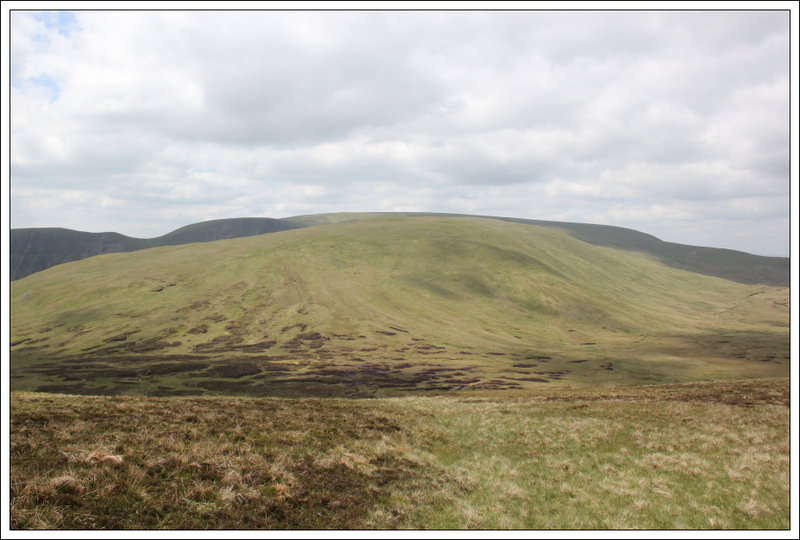 The ascent of the lower slopes of Carrifran Gans was not particularly pleasant - an ascent through long grass, tussocks and bracken. 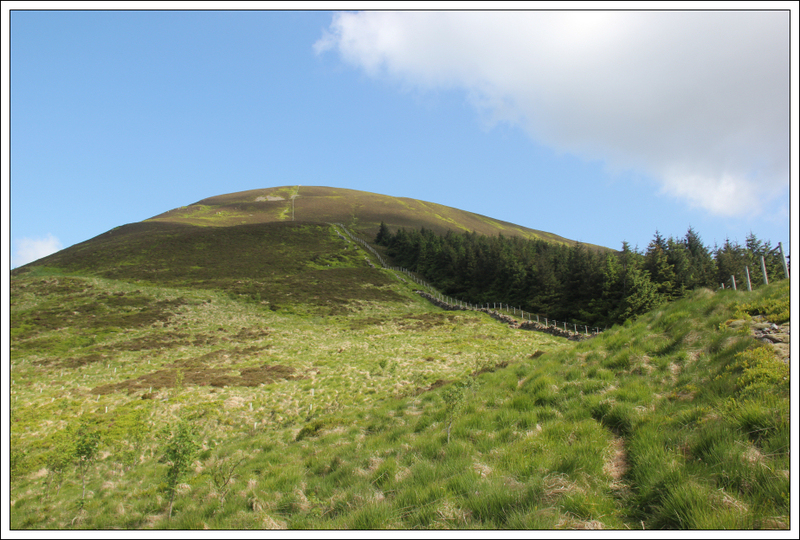 Beyond the rough lower slopes the ascent was relentlessly steep. I stopped several times during the ascent to let my heart-rate slow down. I didn't expect to see anyone else ascending via this steep route. 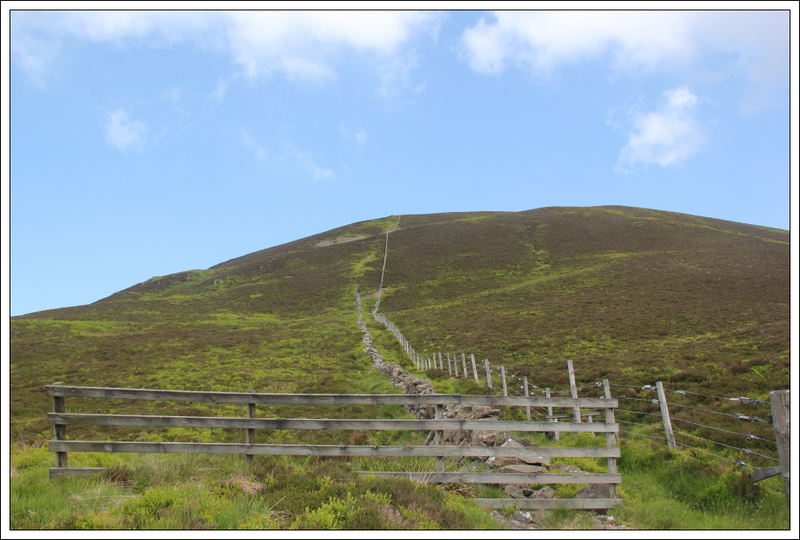 I was therefore quite suprised to see someone running up the steep slope! The Harry Enfield catchphrase came to mind, "That bloke's a nutter!" 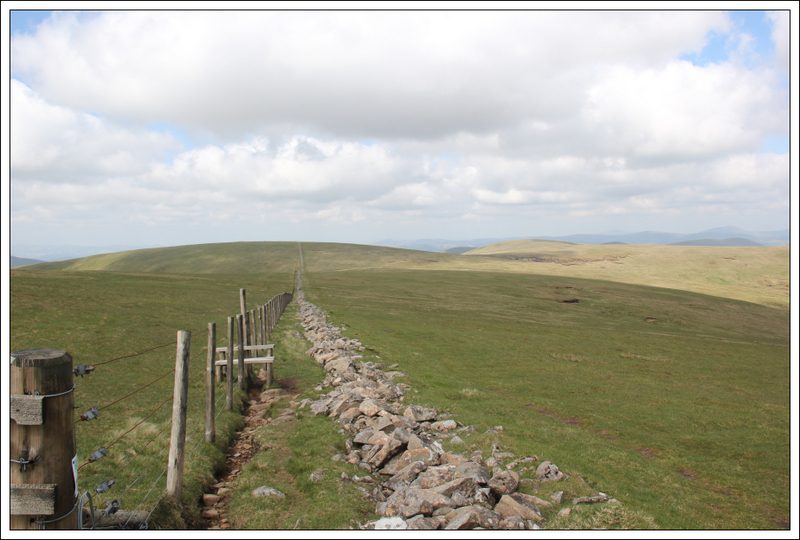 It was relief to swap steep slope for gentle walking as I walked the final few hundred metres to the summit. Carrifran Gans is a New Donald. 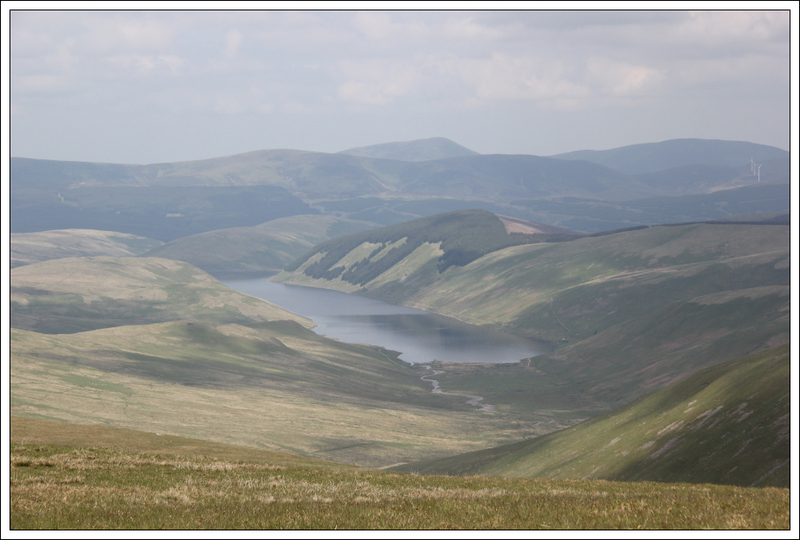 A short distance beyond the summit of Carrifran Gans I was overtaken by the fell runner. 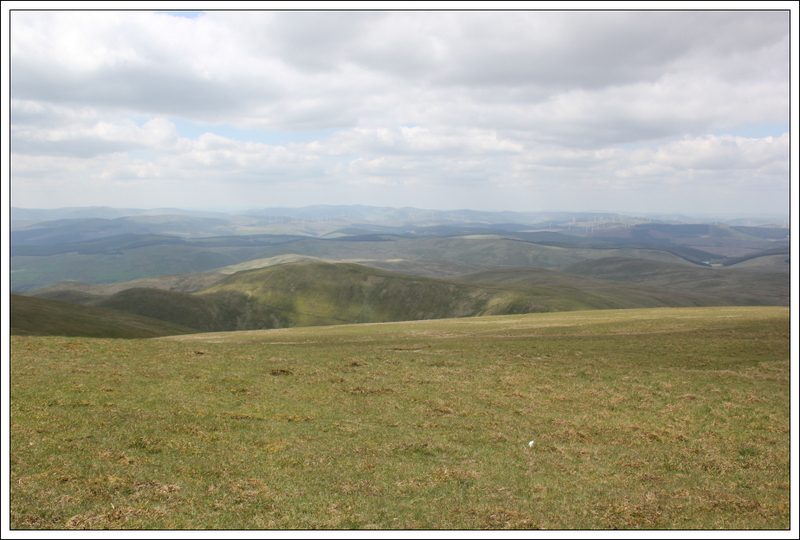 Throughout the rest of the day I met no-one else on the hills. 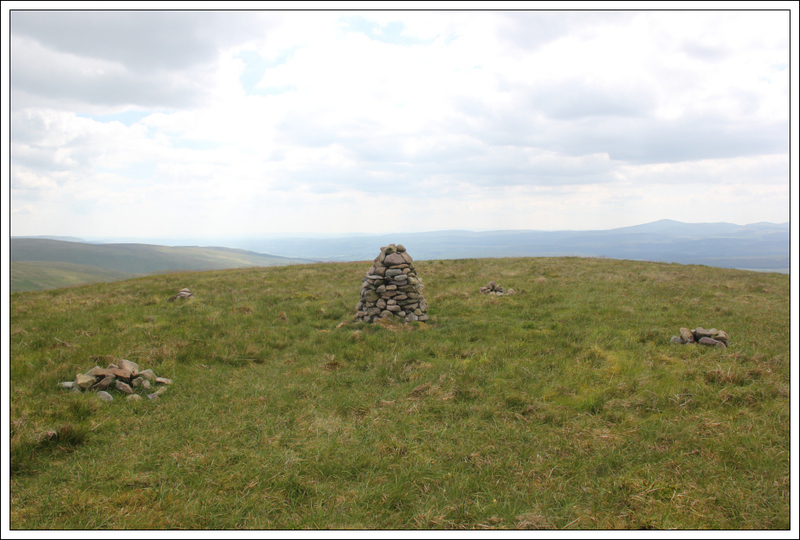 It didn't take long to get from Carrifran Gans to White Coomb. 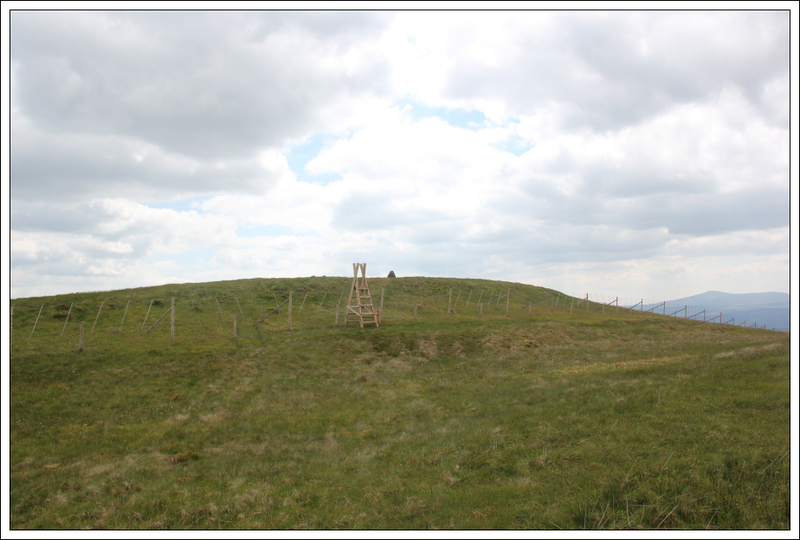 I last ascended White Coomb in March 2008. White Coomb is a Corbett, Marilyn, Donald, New Donald and HuMP. 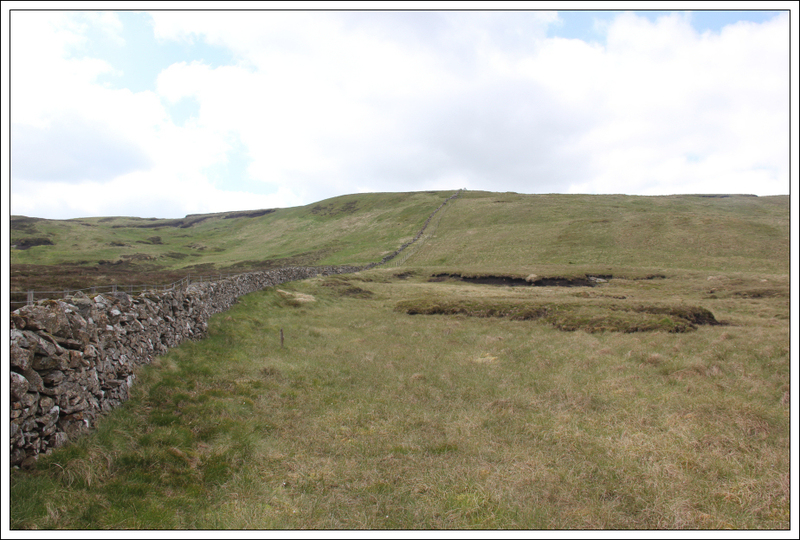 From White Coomb, I made my way across to Firthhope Rig. On reaching Firthhope Rig I stopped for my first drink of the day and to put on more suncream. 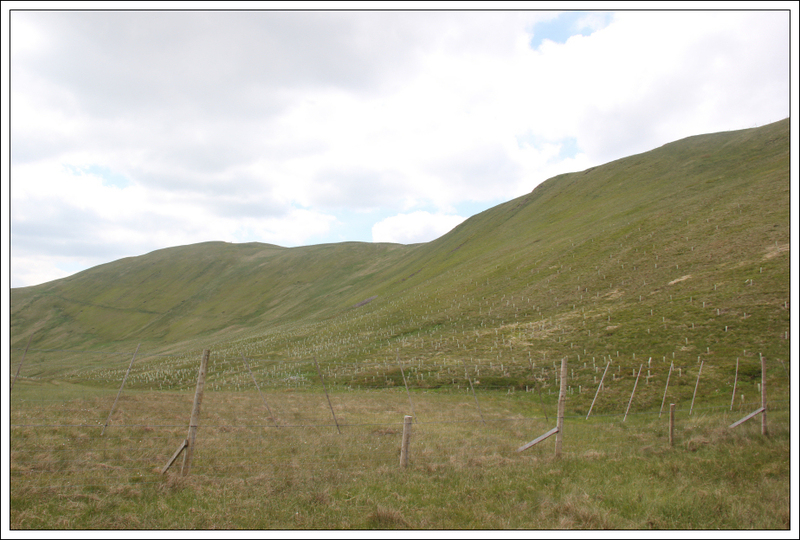 The easiest line of descent from Firthhope Rig to Rotten Bottom follows the fenceline. Rotten Bottom was interesting in name only. 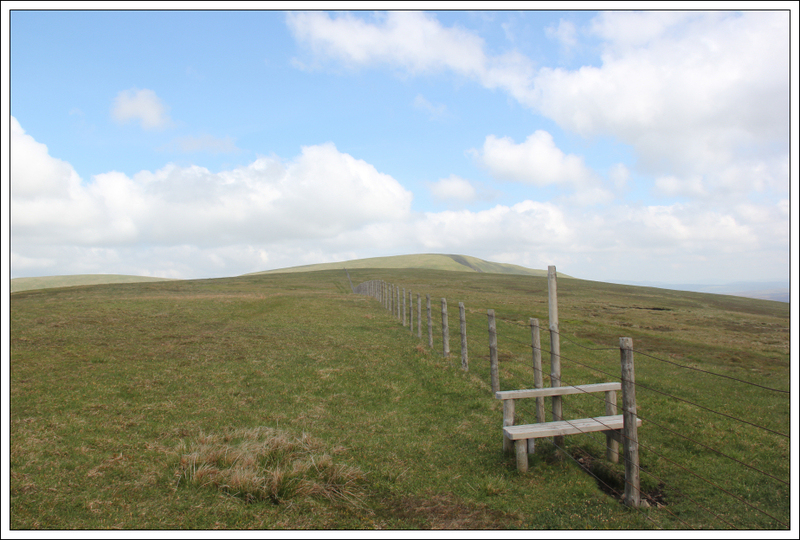 An area with a number of large peat hags and much wetness at the col.
From Rotten Bottom, I followed a fence ascending towards the col between the 685m top and the 709m top of Cape Law. 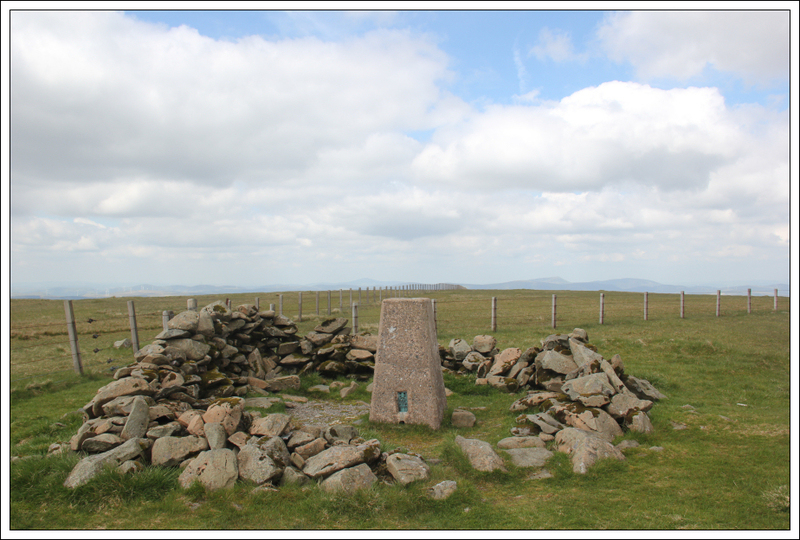 Despite Cape Law being a Donald, I decided not to bother taking the detour out to reach its summit. I have ascended Cape Law previously and have no intention of ever doing a second round of New Donalds! 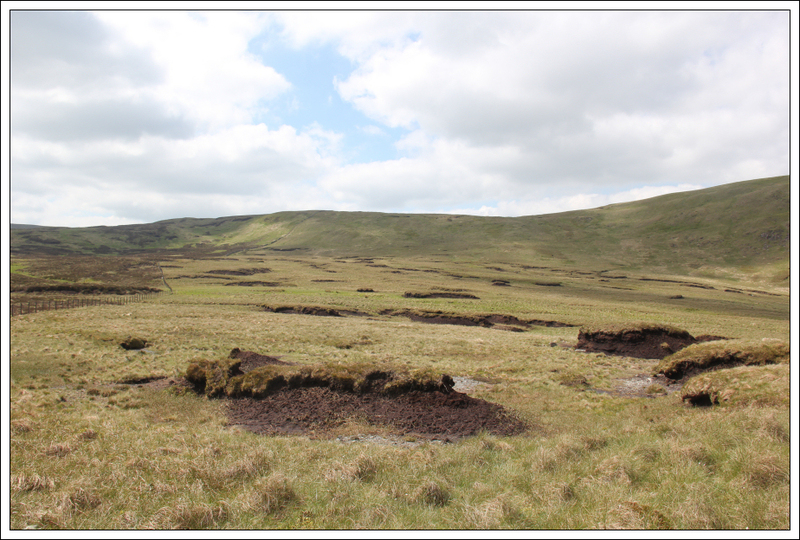 Before reaching Hartfell Rig, I again had to lose height and cross through another area of peat hags and wetness. 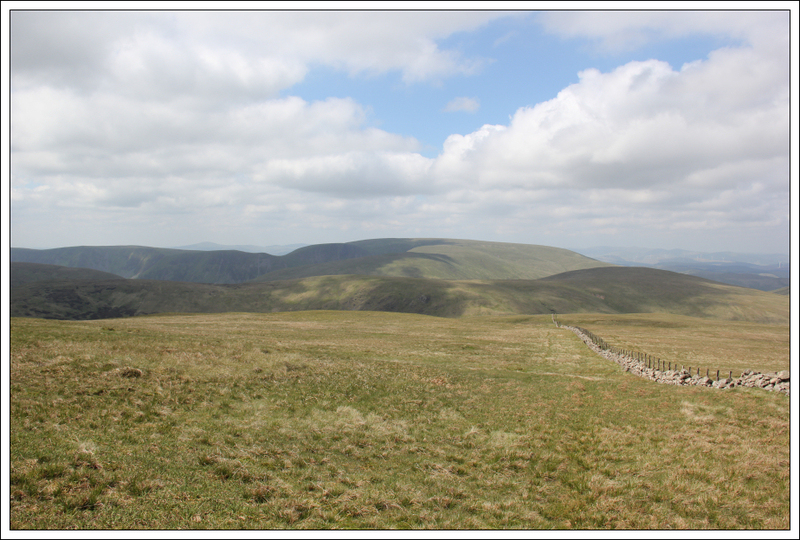 From Hartfell Rig to Hart Fell the terrain was much more pleasant - dry, short grass. 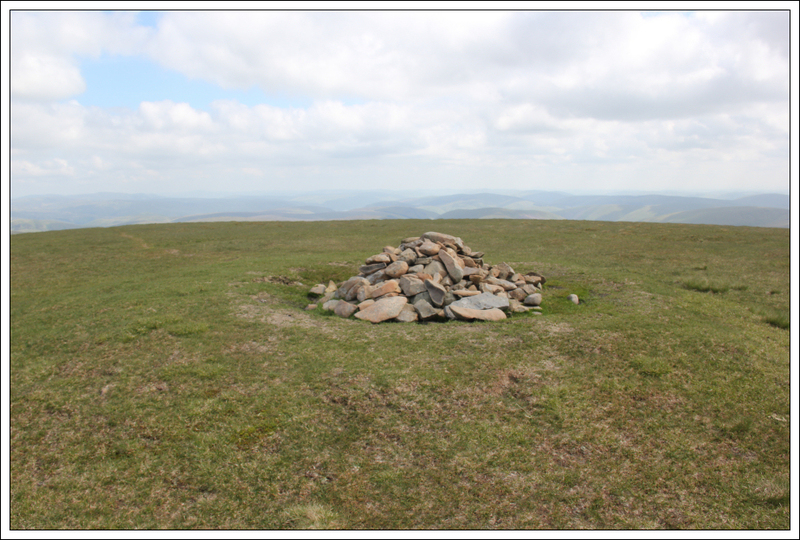 I last ascended Hart Fell in April 2009. 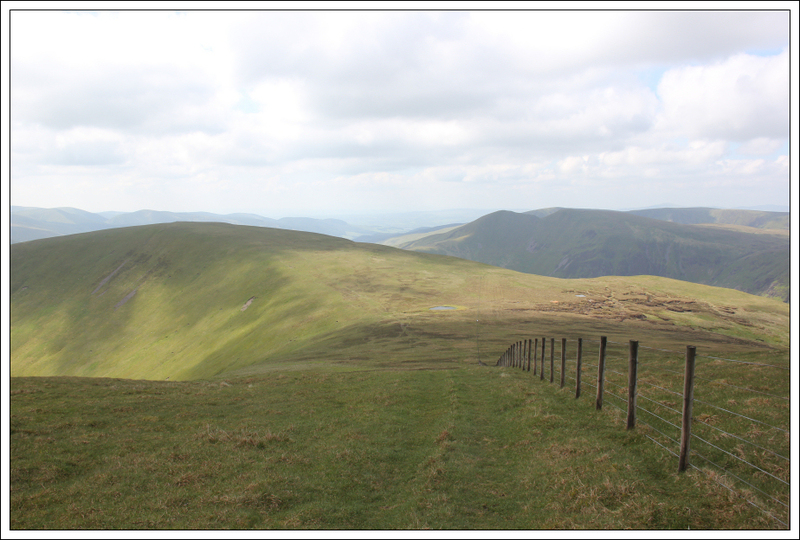 My first ascent of this hill was mostly in mist so it was nice today to get some views. 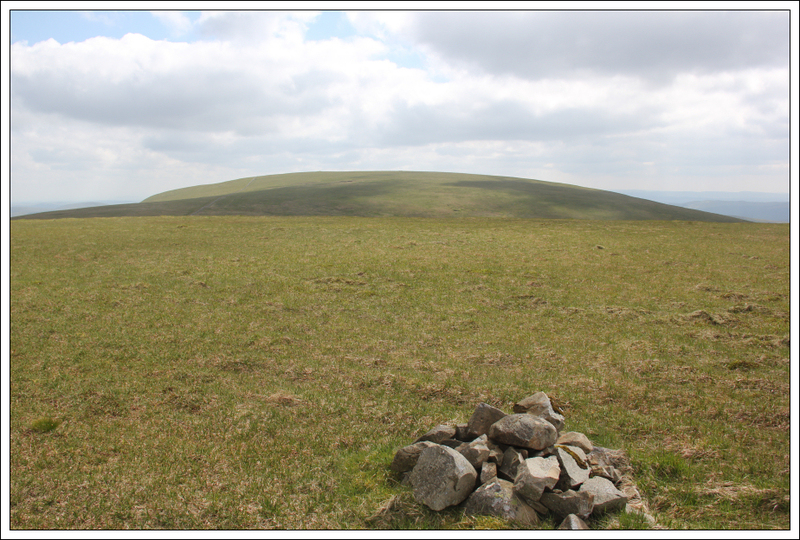 Hart Fell is a Corbett, Marilyn, Donald, New Donald and HuMP. 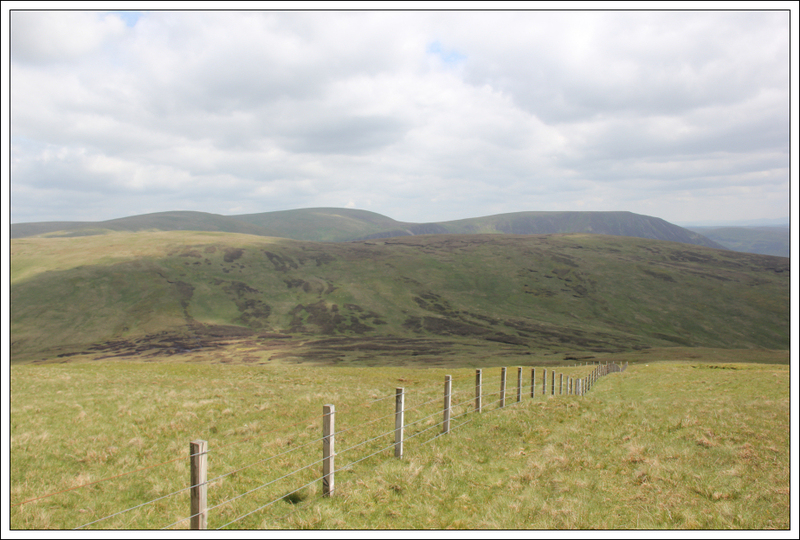 From Hart Fell, I followed another fence with the intention of ascending Whitehope Heights. 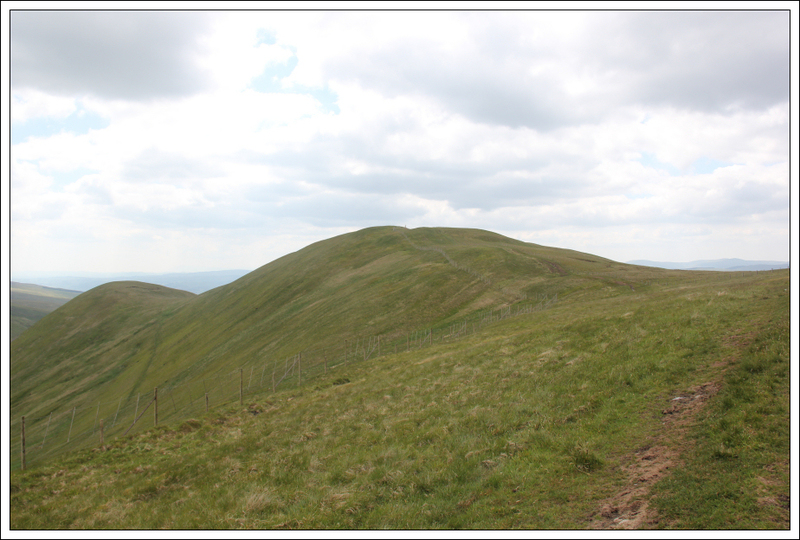 The final descent to the col between Hart Fell and Whitehope Heights was fairly steep as was the initial ascent of Whitehope Heights. 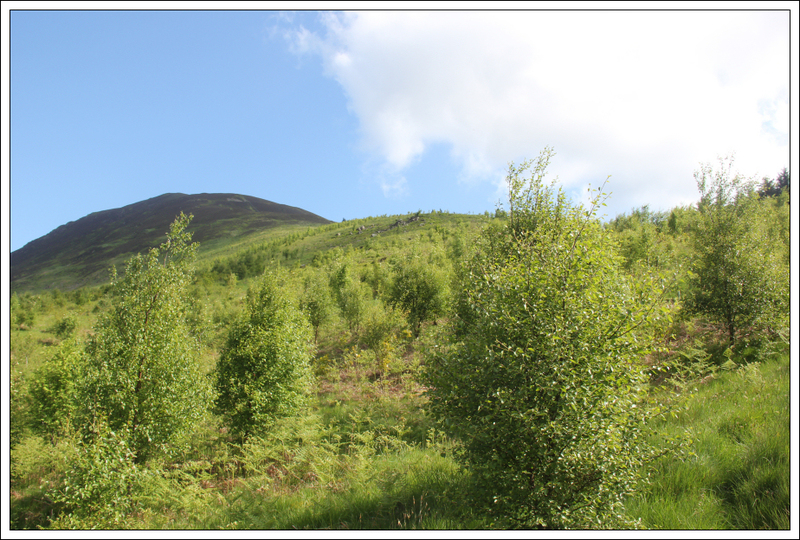 It was nice to see lots of newly planted trees. 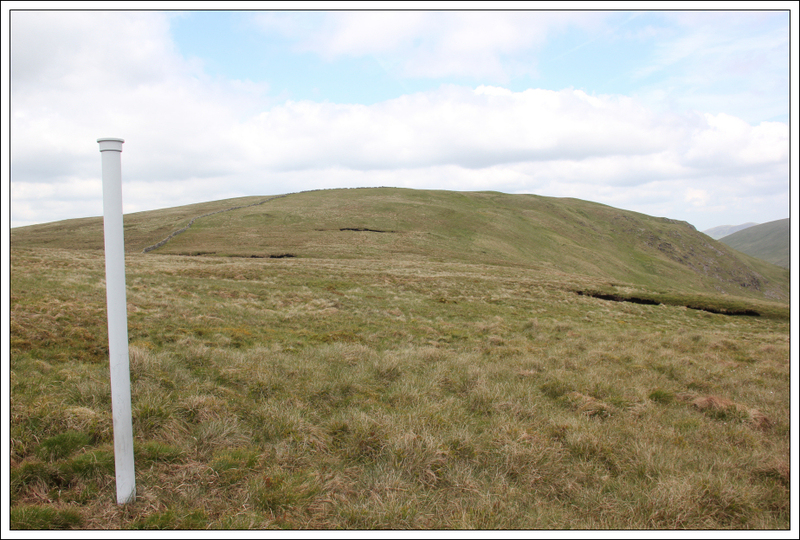 Yesterday I passed two pre-windfarm masts on Coomb Dod and Hudderstone. 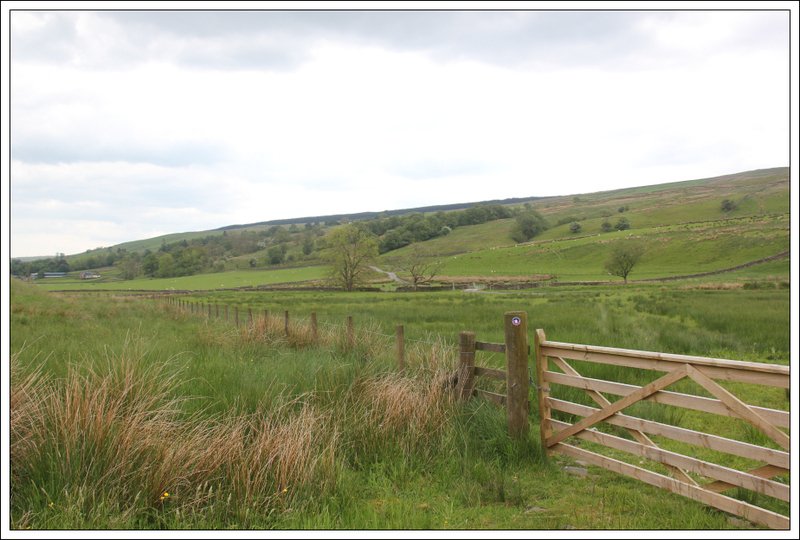 Today I passed yet another pre-windfarm mast just below Whitehope Heights. 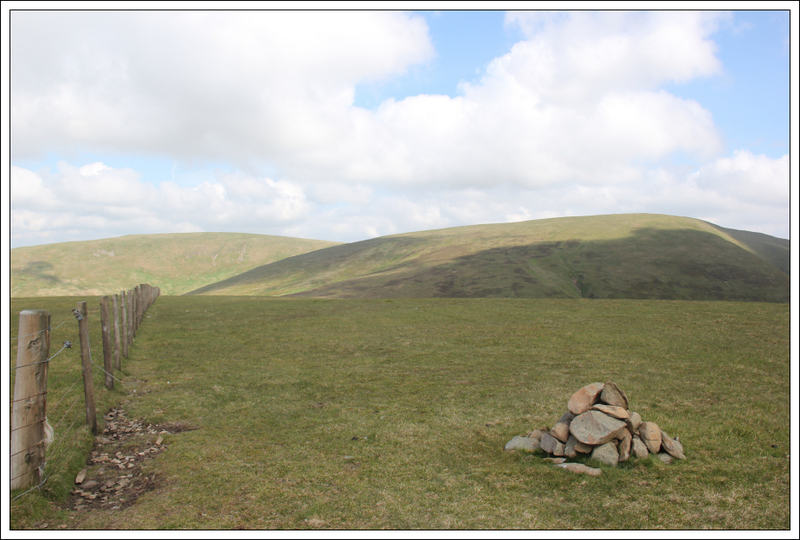 I had to climb over a steep stile to reach the summit of Whitehope Heights. Whitehope Heights is a Donald, New Donald and HuMP. 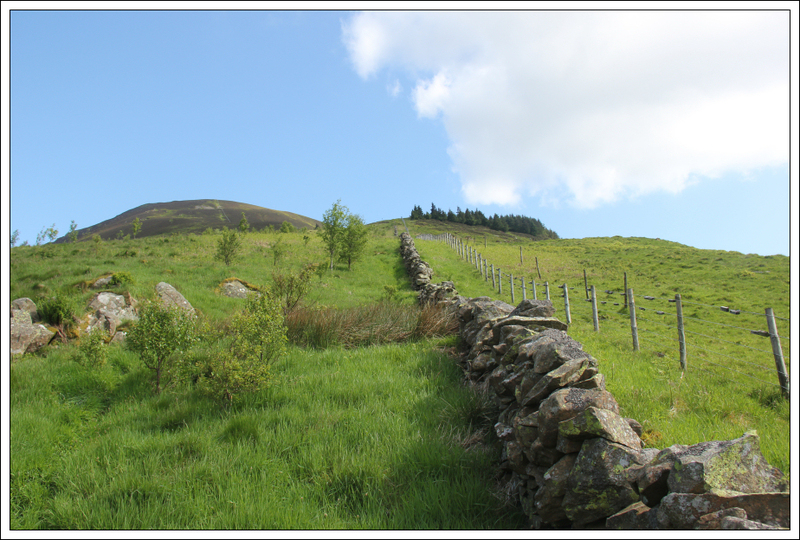 What I should have done after visiting the summit is climb back over the stile. I ended up on the wrong side of a high fence. 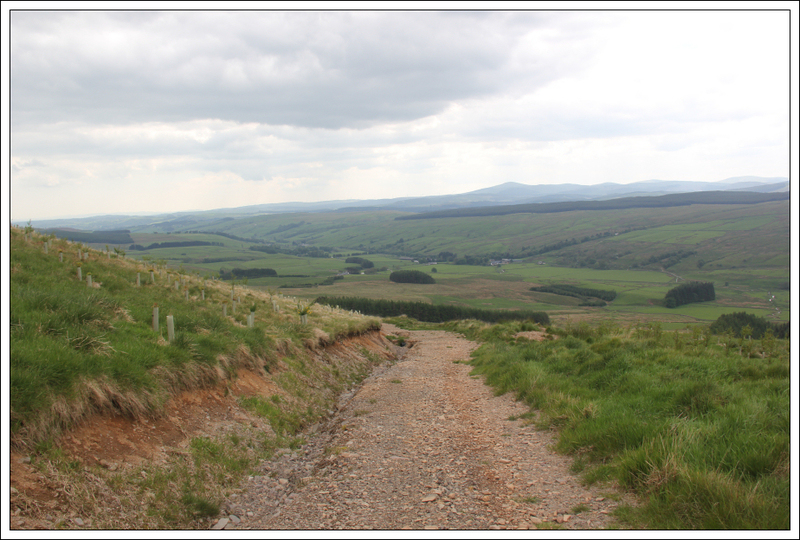 I therefore decided to make up my own route off the hill. 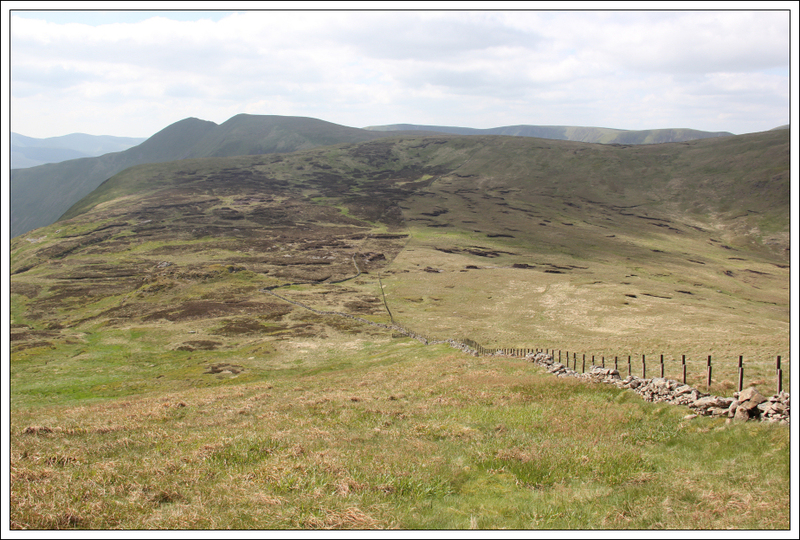 I really wish I hadn't as I ended up descending via some really awful terrain. 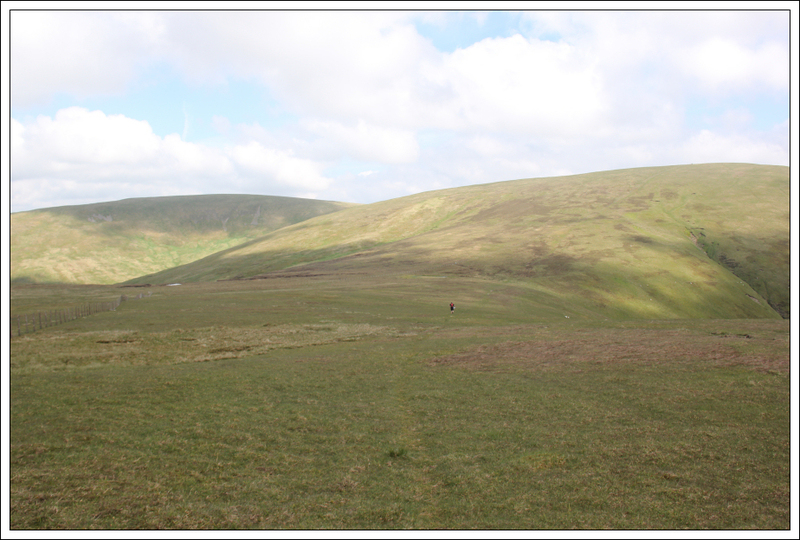 I was considerably relieved to escape the poor terrain and reach a large track that is not marked on the map. 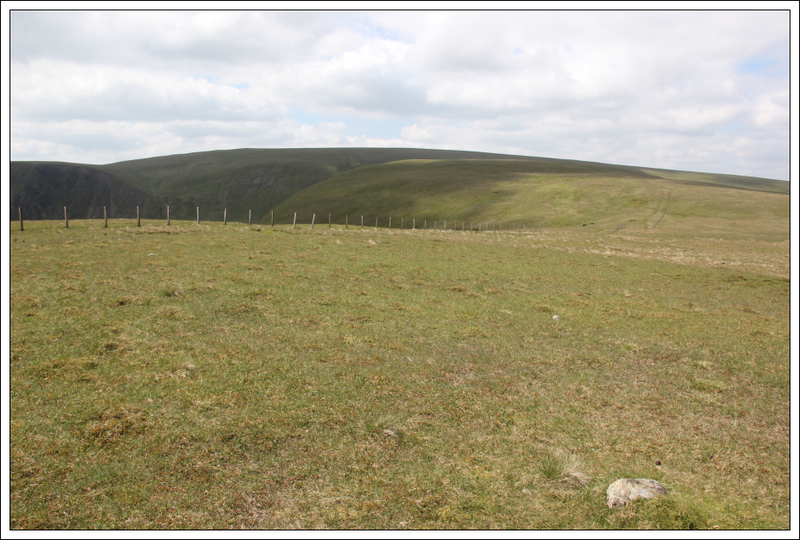 This bulldozed track was likely used for the planting of thousands of new saplings on the hill. I also think it is very convenient for a new windfarm! 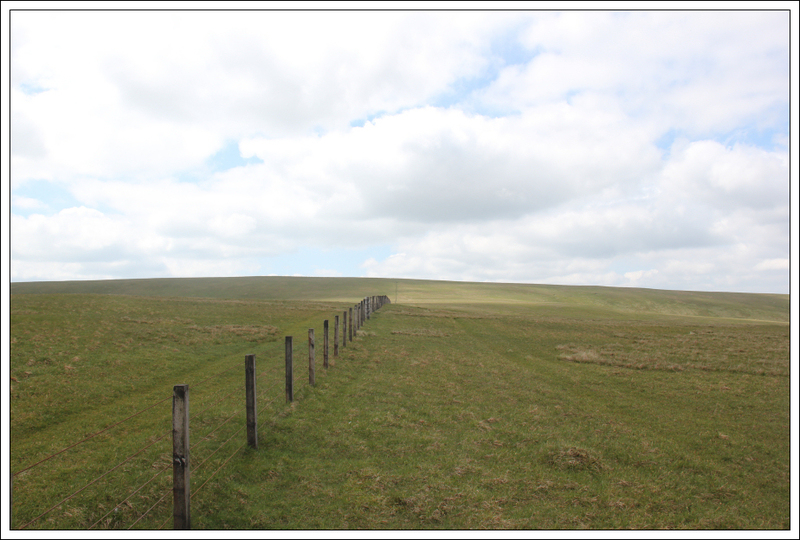 I eventually reached some waymark signs for the Annandale Way. 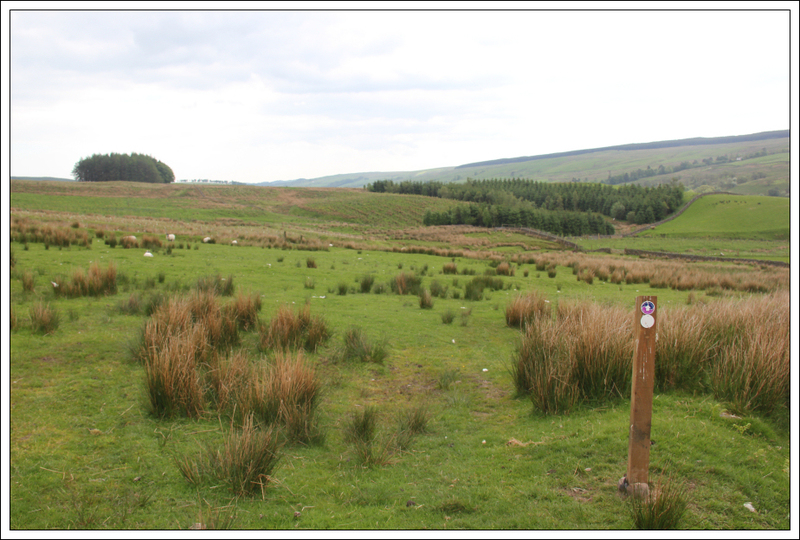 I followed these signs back out to Ericstane. An interesting traverse in fantastic weather.